Santa Monica, CA — On Monday of this past week, I had painful Gum Surgery. By Friday, I had my first real meal in days, and it was outstanding. When the Universe (or rather, your public radio station) offers you a complimentary dinner, the answer is always, Yes! Whether you feel great or not, whether you are not sure if you can chew or not, and whether your plus one can make it or not. Just say Yes. A good mantra for 2017. Friday: On the train to downtown LA. I will never decline a dinner (or lunch) invitation to meet a friend downtown ever again after experiencing the pleasure of taking the Expo Line train from Santa Monica: So nice not being stuck in traffic on LA’s congested freeways! At 6 PM, the Expo line was packed with folks heading back East after a day at the beach, but the hour commute passed quickly. There were one (or ten) people yakking away on their I-phones, but other than their inconsiderate selves, everyone seemed in good spirits which helped lift mine, as well. The walk from 7th & Flower to 3rd & Broadway was a bit of hike, but to a New Yorker, the trek would mean nothing. Luckily, this Santa Monican was up for it (having lived and worked in Manhattan for two years). 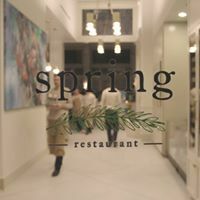 Arriving at S P R I N G.
What was great about Sophie is that she could not have cared less that I was without my Plus One, she was happy that I came and with great ease, comfortably installed me at the cozy Bar where I could enjoy my meal and observe the beautiful dining room and spacious kitchen at Spring. A trio of musicians were playing some lovely traditional music. The ambience was just right. At the bar, I ordered an Antique Gold (saffron infused Old Tom gin, dry vermouth, lemon oil, served up). Strong but beautiful, I wisely decided to sip it…slowly. Afterall, this was my first sip of alcohol all week as well as my very first meal! I wanted to savor the occasion. A beautiful dark-haired woman approached me at the bar, greeting me like an old friend. 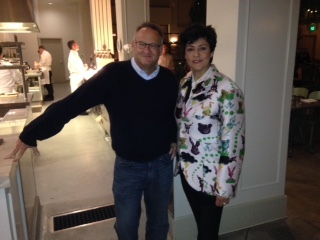 This was Yassmin Sarmadi, one of the partners at Spring, and the wife of the chef, Tony Esnault. Persian New Year. Nowruz Pirooz. What’s great about this dinner, this celebration of the Persian New Year, is that it’s all new to me. A new experience. Viva Life! Even slightly sedated and flying solo, I was able to take advantage of this cool opportunity to explore a new restaurant and to learn about a different food culture. 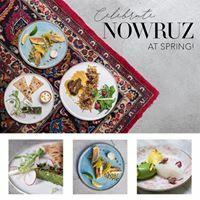 Spring is a French restaurant, but for tonight and the two evenings prior, Chef Tony and Yassmin had prepared a very special, 5-course, tasting menu commemorating Nowruz, the Persian New Year. Nowruz. Passover. Easter. These holidays all celebrate the food of Spring. Yassmin and I had a great discussion about the Right of Spring in Iran, and how the meal was the culinary welcoming of the new season with the first harvest of spring herbs, vegetables and lamb. Lovely. Just lovely. Heretofore, I had never given much thought to how Iranians celebrate Spring in their cooking. Food has the power to unite us, and on this Friday evening in downtown Los Angeles, it did just that. There I sat at the bar, making new friends, and being introduced to new foods, new traditions, and new music. Nothing better. The first course, Kuku Ye Sabzi, was a “frittata” of herbs, walnut and egg, topped with barberries and served with “sangak” bread and house-made yogurt. Delicious. Spring onions and Radish garnished the plate heralding Spring, my favorite season. 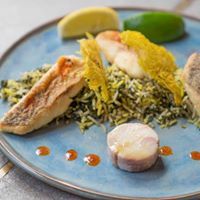 The second course, Sabzi Polo Ba Mahi, was a duo of smoked and pan-seared white fish, served with basmati rice and house-made pickled vegetables, and let me tell you, I have never eaten a more tasty piece of smoked fish. (photo above) Major Umami moment for me and my palate. The main course, Reshteh Polo Ba Mahiche, was a succulent slow-braised lamb shank, served with rice and toasted wheat noodles, dates and raisins. Wow. Just wow. My second Umami moment of the meal. The lamb was fork tender and just melted in my dentally reconstructed mouth. So so good. 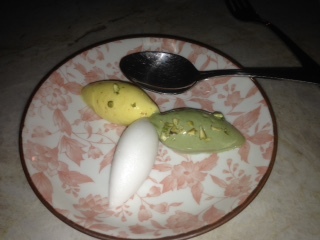 The fourth course, Bastani, was a trio of house-made Ice Cream: Pistachio (yum), Saffron (savory and exciting), and Rose (surprising and not perfume-tasting — my clear favorite). The fifth and final course, Chai Va Shirini, was samovar brewed black tea served with a trio of cookies: Baklava, marzipan “toot”, and “nokhodchi.” The strong tea and these bite-sized cookies were the perfect finish to an outstanding meal. I sat at the bar, savoring my drink and wondered if Jonathan Gold, LA’s premier food writer who was sitting across the room, was having as wonderful an evening as I was. I hoped he was. The chances were good. So there I sat, feeling slightly dazed and pleasantly stuffed, elated with this new dining experience as well as the cultural exchange of making new friends in Sophie, Yassmin and Chef Tony. Lesson Learned: Continue to try New Things. Go to New Places. Meet New People. Whether You are with your Plus One or just flying solo. Go. Also, support Public Radio. Thanks KCRW and the folks at Good Food (Evan Kleinman, Camelia Tse, Abbie Swanson). I look forward to returning to Spring to see and to taste how they celebrate Summer. Surfing Ocean Park and Destinations Unknown in SoCali. 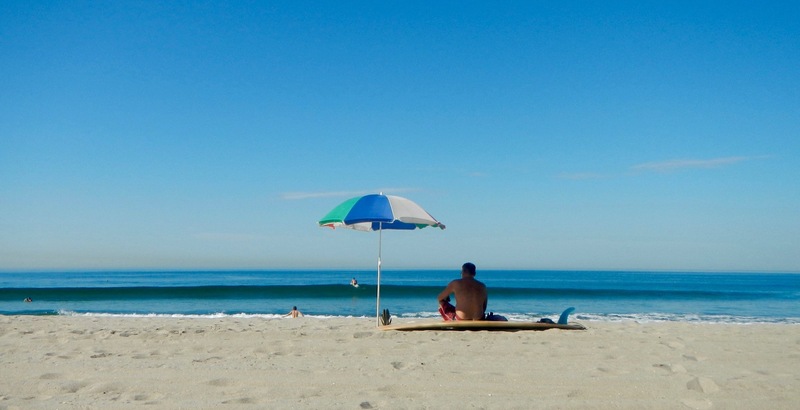 This entry was posted in Surfing Life and tagged Easter, Evan Kleinman, Good Food, Jonathan Gold, KCRW, Nowruz, passover, Persian New Year, Spring Los Angeles, Spring Vegetables. Bookmark the permalink.